This is a good read. There are some ads that show some neat accessories for the iPad too. iLounge has released The iPad Buyers' Guide + Free iPod/iPhone Book 5, and as always, we have an awesome contest to coincide with our latest publication. 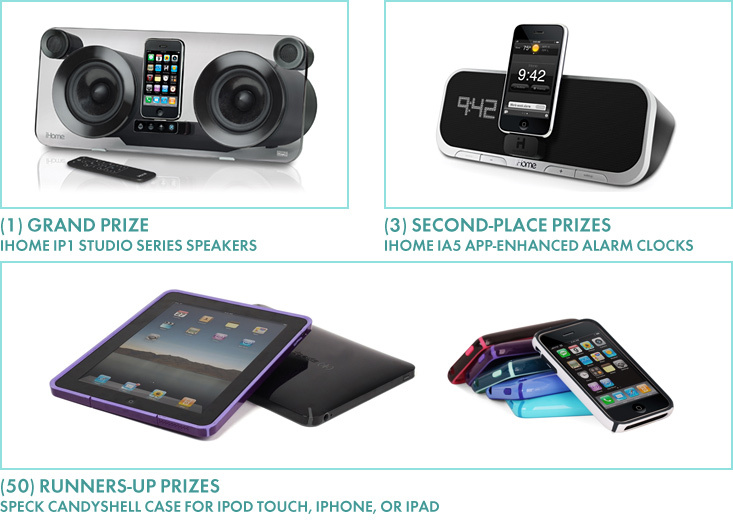 Four people will win brand-new speaker systems from iHome, and 50 more will win iPad, iPhone, or iPod cases from Speck Products! How can you win? Share the iPad Guide! Retweet the following message in bold below—unedited, or preserving the bit.ly URL—to your followers. There are two ways to win: 50 retweeters will be selected at random to win fantastic, award-winning CandyShell cases from Speck (MSRP $35-$50 each), and will get the choice between iPod touch, iPhone, and iPad versions. An additional four people will be selected by iLounge for special prizes from iHome, including the award-winning iP1 (MSRP $300) and iA5 (MSRP $100) speaker systems, based on the number and positive influence of their retweets over a two-week period. We've made this contest easy to enter and almost as easy to win! You have two weeks to spread the word for your chance at outstanding speakers and cases! 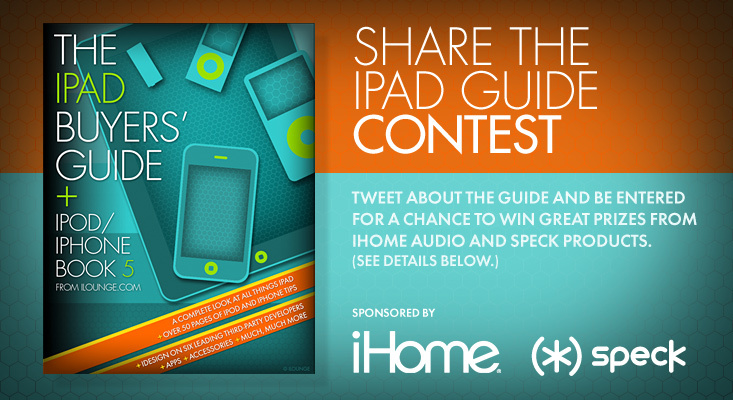 The Share the iPad Guide Contest begins as of this posting and ends on June 15, 2010 at 11:59PM Pacific Time. Entries will be judged by iLounge. Do not enter if you can't stand losing, and don't disparage the winners. Winners will be announced June 16, 2010 on this page, and via Twitter. Determinations of number and positive influence of tweets will be based on Bit.ly analytics for an individual account, and made solely in iLounge's discretion. You may retweet as many times as you want. This contest is open to U.S. and international residents. All taxes are the sole responsibility of the winners. Associates, employees, principals, or relatives thereof of iLounge are not eligible. iLounge reserves the right to modify these terms to comply with the laws of the State of California, to correct errors and omissions, or to ensure fairness as determined by iLounge. Such modifications, if any, will be posted at iLounge. Your entry implies and expresses your agreement to these terms and your waiver of any other rights, related to such giveaways, you may have in any jurisdiction.